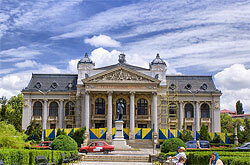 Iasi is the largest city in Moldavia, the eastern region of Romania. It was the capital of the Principality of Moldavia for three centuries, and has served as a temporary capital for Romania during the First World War, when Bucharest was under foreign occupation. Being a home to the oldest Romanian university, Iasi has become a major cultural and academic centre of Romania, with over 70,000 students every year. More than 50 churches, a famous Botanical Garden, and many museums and memorial houses, made Iasi an important touristic centre in Romania. The centre of the city is the Golden Plateau, around which the settlement developed over centuries, and it is home to an impressive number of Orthodox churches. The oldest church is the Saint Nicholas Church, dating from the reign of Stephen the Great (1491). The most impressive though are the St. Paraschiva Metropolitan Cathedral and the Three Hierarchs Church, an example of Byzantine art built in 1635-1639. With the Palace of Culture and the Union Square on each sides, the Golden Plateau has become a landmark when visiting Romania. Many other important sites can be found on nearby streets. Two train stations serve the city, with the Central Station providing direct rail connections to all major Romanian cities, and also to Chisinau. Iasi is connected to Bucharest through a European route. The city is also served by the Iasi International Airport, which has nonstop flights to and from Bucharest, Timisoara, Budapest and Vienna. To get to the main city of Iasi, you could use the Iasi Airport Transfer service. Rail stations in Iasi are very well connected to all the parts of the city by an extensive public transport network, which consists of more than 100 trams and buses. There is also the option to rent a car using the services offered by EuroCars. Due to the economic boom of the recent years and the increasing number of tourists, Iasi has thought of many accommodation offers, such as hotels and hostels and the alternative of renting short and long term apartments. Finding the appropiate dining place in Iasi isn't difficult. A great number of restaurants and bars are available, many of them serving traditional Romanian specialties. There are also fast foods available. Iasi has several shopping centres available throughout the city, and there are also plenty of places to buy souvenirs at, the most common being related to Romanian folklore. Apart from the occasional events that take place in Iasi, there is always a theatre or a cinema to go to for entertainment, as well as art exhibitions. Nightlife in Iasi has a lot to offer on its own. Iasi has something for everyone, like bars and clubs, discos, or even casinos.